Little, Brown and Company, 9780316412247, 352pp. The ultimate collection from Maximilian Uriarte, author of The New York Times bestselling THE WHITE DONKEY and creator of the world's most popular military comic strip. 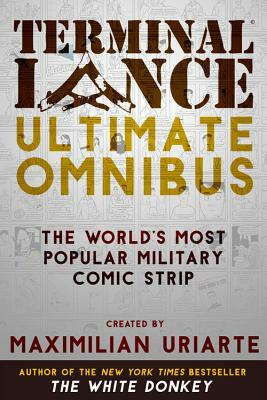 Terminal Lance Ultimate Omnibus was written and illustrated by infantry Marine and Iraq veteran Maximilian Uriarte, creator of the hit comic strip "Terminal Lance." Uriarte enlisted in the United States Marine Corps in 2006 at the age of 19 and served for four years. During his first deployment to Iraq in 2007 he served as an MRAP turret gunner and dismount of India Company's "Jump" platoon in the Zaidon region southeast of Fallujah. He deployed to Iraq again in 2009 as a billeted Combat Photographer and Combat Artist, then enrolling in California College of the Arts. In 2010 Uriarte created the popular comic strip "Terminal Lance" while still on active duty. The strip is now published in The Marine Corps Times and has grown immensely in popularity. "The Marine Corps likes to present itself with dutiful seriousness. Terminal Lance is a counterpoint to that. It is a tribute to the service's permanent underclass, the young grunts who are too weary to feign enthusiasm anymore." "Uriarte is the Bill Maudlin of millennials. His comic is earthy, cynical and profane, as anyone who has spent time around enlisted Marines would expect. But he also is surprising in his views. He is, for example, scathing about veterans who wail about how gays and women have ruined the Marine Corps.... [This] is probably the best book about Marine Corps culture in decades." "Hilarious.... A winking self-awareness and compassion for the daily drudgery of the grunt's life make his collection more than a mere peek into a troop's insider experience--he's poised to become a Bill Maudlin for the social media generation." "Terminal Lance is true and vital and hilarious." "A clear-eyed view of life as a grunt.... The strips, drawn in a simple, unadorned style, sardonically depict the near-daily tribulations and occasional pleasures of military life.... A rare opportunity for those on the home front to get a sense of the true concerns and feelings of those deployed overseas." "It was 2010 when Uriarte, a lance corporal in the Marine Corps, created the online comic 'Terminal Lance,' which swiftly developed a fan base. Using some of the same characters, he created a more serious and involved graphic novel, THE WHITE DONKEY, based on his 2007 deployment in Iraq."